I was recently at one of our customer’s offices and we were bouncing from topic to topic about their business. I was asking where most of their customers are located, how far they’re driving to jobs and how many jobs they can get done throughout the day. They mentioned something that I had never heard of businesses doing before. Last year, towards the end of the season, they “traded” customers with another business in the area. They informed about twenty of their customers that they weren’t going to be renewing their contract the following year with them, but would recommend another company in their area that was one of their partners and the company that they traded customers with was comparable in service, they receive great reviews from their customers and had a great reputation in the area. In return, their business received the information for twenty customers that were closer to the city they were based out of. 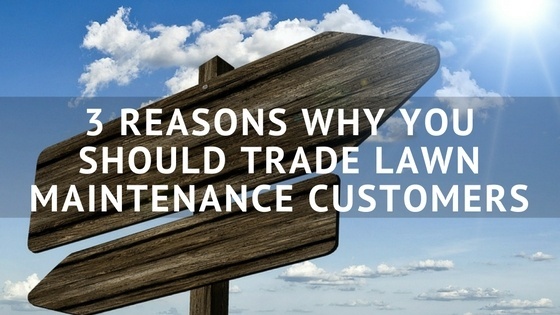 It allowed for their business and the other lawn maintenance provider they traded with to tighten up their service area and their customers received better service for it. It was a win-win-win. It sounds kind of impersonal at first and that trading customers could be bad for business, but here are three reasons why you should try it out with your lawn maintenance business. As a lawn maintenance business, you can become more efficient and profitable if you have a tighter area to service. One of the main reasons why you would “trade” customers is to reduce your crews’ drive time. If you’re able to trade a few customers that are further away, but might be in another company’s back yard, it is mutually beneficial for you to trade a few customers with them. A tighter radius is a lot easier to service because of your proximity to your customers. You’ll be able to service your clients better, which will likely lead to greater customer satisfaction. While you might have some pushback from newer customers and you might not retain all brand new clients, you have the opportunity to show that this situation is a better fit for them. One benefit of trading lawn maintenance customers is that it could actually help you generate more leads. If you find a business that is willing to trade a few customers with you, you’re gaining new customers. You have the opportunity to make a great first impression and ask them for referrals, just like you would with any other new customers. If you actively trade clients with another lawn maintenance business, you’re gaining a better foothold on your competitive market. Even though you’re relinquishing customers to another business, you’re gaining more control over a market that you want to have control over. Trading customers for others that are better suited for you to service will make your business stronger and even more marketable. If you own a larger percentage of accounts within the area, you’re setting your business up for future success. Want to take even more control of your lawn maintenance business? Sign up to learn more about FieldCentral - the easiest way to take control of your business. Just click below!